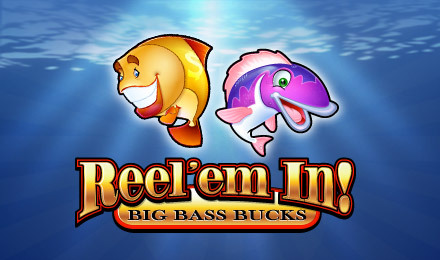 Go fishing for fortune on Reel em' In Slots, a 5 reel 20 payline video slot machine that's swimming with juicy jackpots! Reel em’ In Slots is a 5 reel 20 payline slot game with a fun fishing theme and the potential for huge cash wins. The game is unique, as a “spin” is the fisherman using a worm to bait the fish. Catch a worthy fish and you could be taking home some super juicy jackpots! The Reel em’ In slot game has a free spins round, which gives players the chance to win seven different prizes during just one free spin. Go fishing and see what fun cash prizes you can catch in this uniquely designed video slot!